Please join us to Celebrate Seven Years of Standing in Our Power! Let’s GET FREE together! 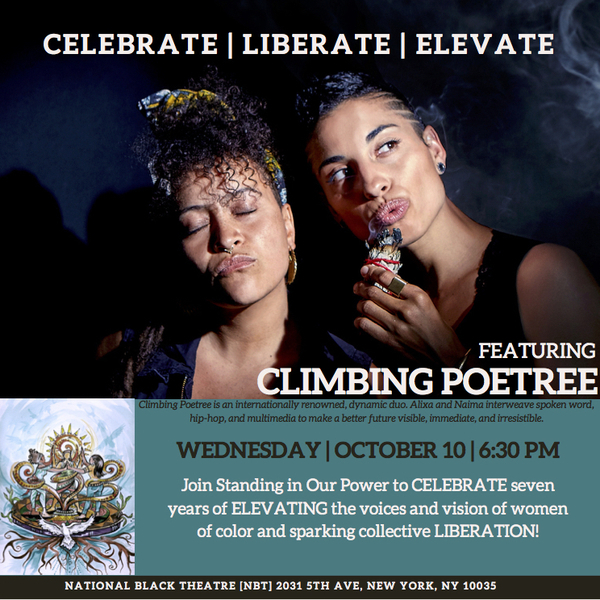 SiOP leaders and our featured artists, Climbing PoeTree, will engage our vibrant community of supporters through creative expression, collective visioning, and ritual. 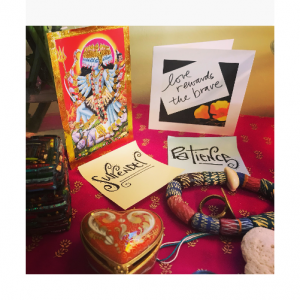 Through their multimedia performances, soul-stirring spoken word, conscious hip-hop, world music, visionary artistry, co-creators Alixa Garcia and Naima Penniman will inspire us to imagine and create a world in which we can all thrive! Come through and CELEBRATE seven years of ELEVATING the voices and vision of women of color and sparking collective LIBERATION! Standing in Our Power (SiOP) envisions a world where trans and cisgender women of color, and gender non-conforming people of color, co-create a new story of holistic transformation, sustainability, and wellness. Through our transformative leadership development and capacity building model, our intergenerational network of social justice movement leaders and social entrepreneurs radically redefines the status quo to ignite personal, structural, and cultural liberation. To learn more about ClimbingPoetree, please visit http://www.climbingpoetree.com.